On a rainy Saturday morning, over 20 volunteers from FedEx joined Museum Volunteers for the Environment (MUVE) for a very wet coastal restoration day. 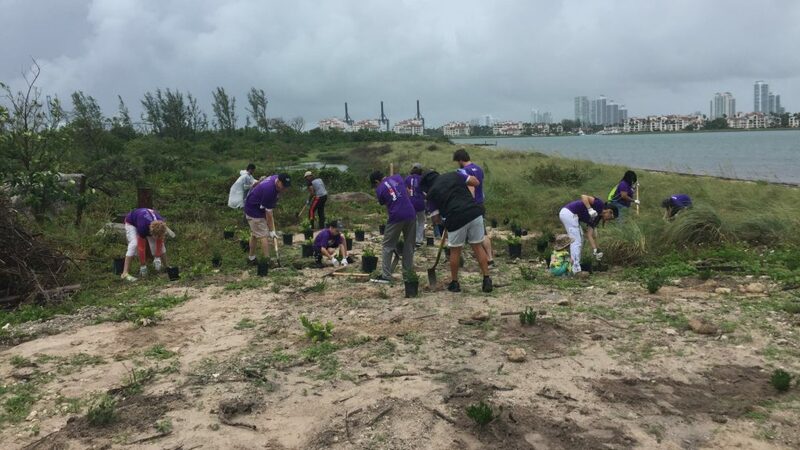 Despite the downpour on May 19, volunteers of all ages helped plant around 400 plants at a restoration site on Virginia Key. This site, which has been nicknamed “The Gap,” has been undergoing restoration since the end of last year. Located in Virginia Key North Point, the gap was a former access path covered in residual invasive vegetation and debris. 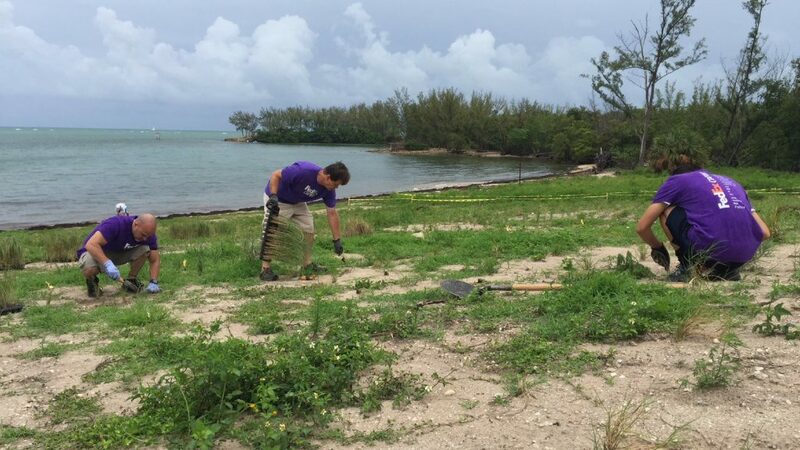 With the help of the City of Miami and Miami-Dade County, invasive species (such as scaevola and Australian pine) were removed from the area before it was flattened for optimal planting. Once cleared, volunteers were needed to quickly stop invasive plants from coming back. 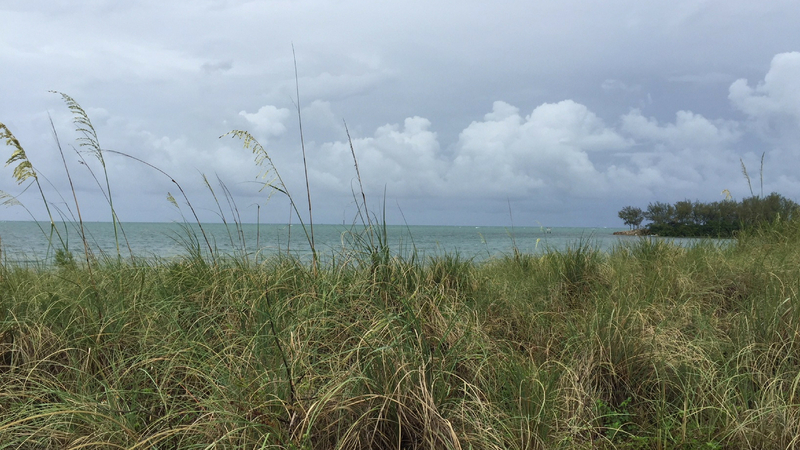 We identified an area at the top of the dune that was suitable for native plant species to thrive—such as beach creeper, coco plum and saw palmetto—and help the dune from eroding during heavy summer rains. Enter: our FedEx volunteers. This hardworking group dug into the sand and tough rocky terrain to plant over 125 of these plants in record time. Next, FedEx volunteers moved down the dune to plant sea oats. This native species helps create living shorelines by stabilizing sandy areas through their deep roots. In order to plant the sea oats successfully, volunteers first removed the invading ragweed plants that were covering the sand. In its place, volunteers placed sea oat plugs which will quickly grow and out compete the ragweed. Even when it began to rain, volunteers were determined to continue establishing the plants into the dune and planted over 250 sea oats. Another group of helpers noticed a large amount of debris littering the coastline. 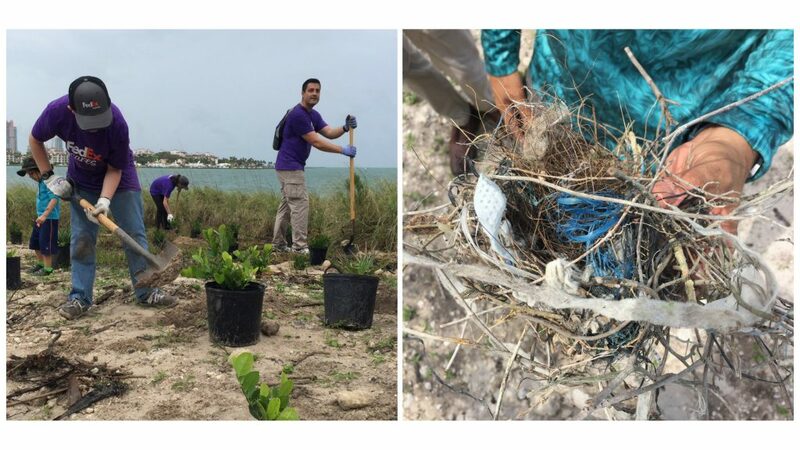 Using the marine debris tracker app, FedEx volunteers became citizen scientists by removing and recording the types of debris they found while cleaning the beach. This beach is an active sea turtle nesting area. By removing debris, not only does the beach become more visually appealing, we create less obstacles for these and other protected animals to move around and thrive. 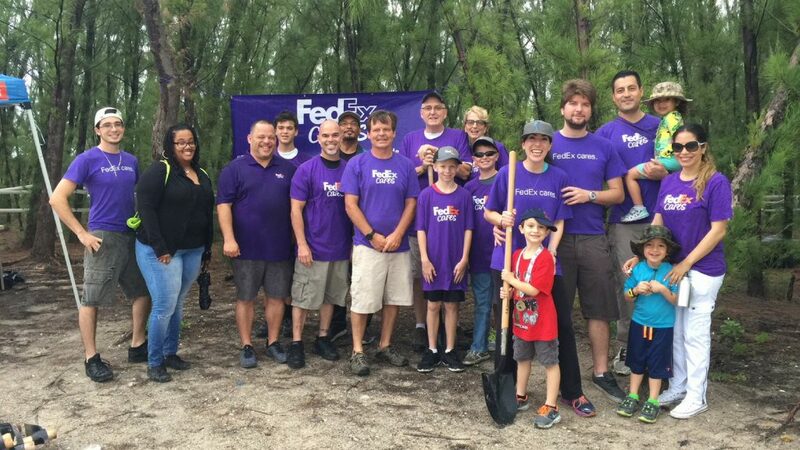 Since 2011, FedEx and the Frost Science have been working together to restore subtropical forests in South Florida through the FedEx Cares program with National Fish and Wildlife Foundation. These volunteers are helping to improve our public lands by making them more wildlife friendly and bringing them closer to their native characteristics—which naturally helps protect South Florida during storms. Since Virginia Key North Point has been a restoration project, there has been a decrease in erosion and an increase in native animals such as water fowl and American crocodiles. We are now witnessing one of Miami’s most historical beaches become an inviting environment for both people and nature.